The rumor mill is hard at work. 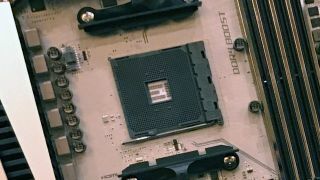 We know what the Ryzen CPU socket looks like but not the CPU. Last week, the word on the street was that AMD's Ryzen CPUs would be skipping the option for 6-core variants. I discussed some of the details of why this might be the case, but now counter-rumors are out suggesting just the opposite—that there will in fact be 6-core Ryzen parts. Which side should be believed? Let's start with the latest supposed leak, which comes via Chinese site Coolaler, with a post that has since been removed. That ought to raise some immediate red flags, but it still doesn't tell us much. The post could have been removed for being clearly fabricated, or it may have been removed due to some form of legal threat. I'd say the former seems more likely, but whatever. Looking at Google's cached version (and employing Google Translate), it's possible to get at the original content, posted by user soothepain, a long-time contributor to the Coolaler forums. Be highly skeptical of the above table, as there's a good chance it's fake. The list of 17 different Ryzen SKUs, broken down into four categories, immediately raises a lot of questions. Will AMD really use the same R3/R5/R7 branding on Ryzen that it's now abandoned for its latest RX series of graphics cards? I'm extremely skeptical of the names in that table, to say the least. There's also this YouTube video showing a supposed RZ 780 6-core/12-thread part running Cinebench. Getting back to the original rumor, if we consider the 'Pro' parts as special models slated for OEMs, that leaves us with nine potential consumer Ryzen parts. The R7 models would all be 8C/16T, the R5 would have both 6C/12T and 4C/8T, and the R3 would be 4C/4T. That last bit implies AMD would have the option to turn off SMT, but it would only do so on the low-end parts. Possible? Sure. Likely? I don't think so. The clock speeds are also pretty obviously a shot in the dark, with no attempt to differentiate the supposed models. What I take from all this, and what I'd suggest you get out of it as well, is that there are a lot of people excited to see Ryzen. That in turn leads to increased potential for rumor-mongering, including blatant fabrications along with not-so-blatant possibilities. AMD for its part is maintaining radio silence, similarly to the RX 480 launch where it kept the branding a secret right up to the final week or so (most places were guessing R9 480), AMD is doing a good job of keeping many details of Ryzen under wraps. We know some of the architectural updates, we know there will be 8C/16T models and up to 32C/64T server variants, and we know the name is Ryzen. But clockspeeds, pricing, core/thread counts, and final model names remain something of a mystery. Since we can't actually buy any of these parts before March, it doesn't matter too much. I personally hope to see 8C/8T instead of 6C/12T, just because that's a more interesting approach IMO, and I wouldn't rule out either one. I'm also still hoping for turbo speeds above 4.0GHz.